Review: Carrie is planning to run away with her Amish boyfriend when her father suddenly dies. Unwilling to leave her younger brother with her dour step-mother, Carrie decides to stay in Lancaster. Her boyfriend leaves the community to pursue his dream of playing professional baseball while Carrie marries another man out of spite. 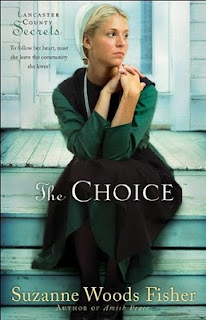 'The Choice' was a free kindle download. My husband said "You are reading an Amish romance-really? Sounds terrible." That pretty much sums up my mindset going into it. I was pleasantly surprised that this wasn't as horrible as I thought it would be. It was chaste (only a few kisses!) and very religious/preachy at times (Amish are a religious people and Carrie's main love interest liked to talk about the bible...a lot) but otherwise, it was okay. It wasn't completely predictable (at one point I wasn't sure where the plot was headed after a main character died) and learning more about Amish culture was interesting. For example, I thought all Amish who chose to live in the English world are shunned. However, you are only shunned if you are baptized and then leave. If you leave before baptism, you can still come back. If you are a religious person who wants an extremely mild romance story, you will probably enjoy this. It is a quick read and free from amazon's website.